Due to a recent refurbishment at Manor Primary School in Wolverhampton, an outdoor area that had previously been used for storage had been converted into a classroom. The project had therefore created space to build additional play areas that also included a basketball court and a five a side football pitch. Main building contractors the Harper Group, contacted Alpha Rail to manufacture metal railings, single leaf gates, balustrade and handrails for the new play areas. The overall objective was to create boundaries that separated key stage 1 and key stage 2 play areas and to prevent any unwanted trips or falls as children used the ramp connecting the new play areas. Alpha Rail was chosen because our metal railings and gates had been specified by the architect following work we had previously done for Wolverhampton Council. The project involved visiting the school to conduct a full site survey and to calculate the gradient of the ramp. To help avoid trips and falls as children walked up or down the ramp we supplied handrails and balustrade which were core drilled in to the walls running alongside the pathway. 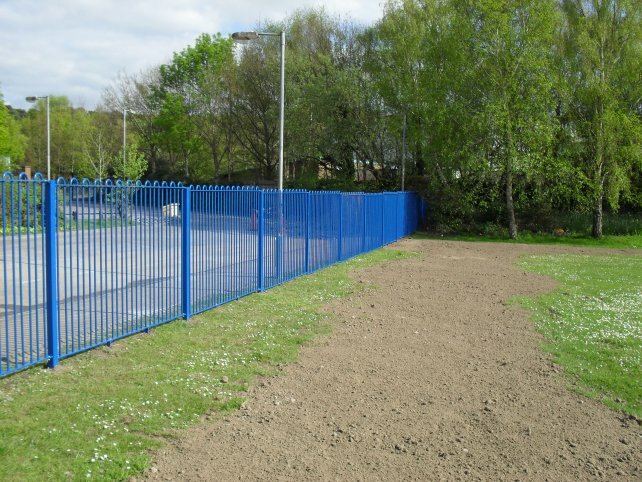 We also manufactured and installed 60 metres of Playspec™ bowtop railings to create a clear boundary between the two playgrounds for safety purposes. In addition to this, Alpha Rail supplied 60 metres of 1100 mm high pedestrian guardrail. Whilst all Alpha Rail metalwork is manufactured to order, this project required some further bespoke metalworking expertise to add a flat top railing feature and supporting handrail on the top of the guardrail. This demonstrated Alpha Rail’s ability to bespoke all metalwork products to meet customer requirements. 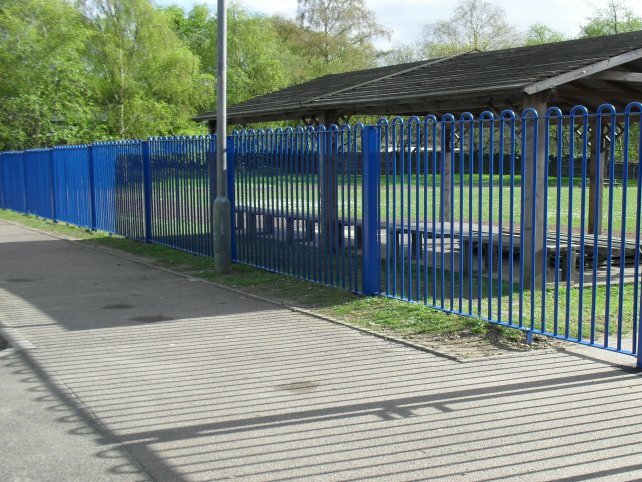 The final finishing touch was produced by supplying the metalwork galvanized and powder coated RAL 5005 signal blue to match the school colours and logo. "This was the first time we have used Alpha Rail and we found them to be very professional in their customer service. Everything provided was manufactured to a high standard and was installed on time as promised. The playground is now a delightful area for the students of Manor Primary School to safely enjoy"